Recently, I entered a poster presentation for a conference for the first time. 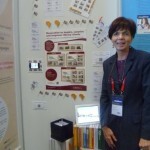 My theme, Celebrating 20 years of INASP, was accepted for the 78th IFLA World Library and Information Congress last month. What I hadn’t counted on was the amount of competition — there were nearly 200 posters being displayed. 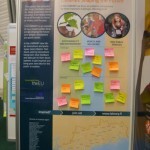 So it wasn’t just being ready to talk people through your poster, there was also the challenge of getting their attention in the first place! Some exhibitors were dressed up or had extra incentives like sweets, bookmarks and keyrings — my favourite was the offer of a story from one of the Finnish public libraries. For the delegates, there was a potentially overwhelming amount of information — as my photos below show, the size of some of the posters meant capturing them clearly (or completely) on camera wasn’t easy. There were A4 versions, leaflets or business cards to take away, but I also saw QR codes incorporated into some posters. Scanning the code with a smartphone for more information was not only quick and effective but also a good strategy when participants are already loaded down with conference papers. Presenting a poster meant agreeing to be available alongside it for the timetabled poster sessions (1200-1400 on two days of the conference). As a result I didn’t have much opportunity to meet fellow presenters, but did manage a quick look around and a number of them immediately grabbed my attention. 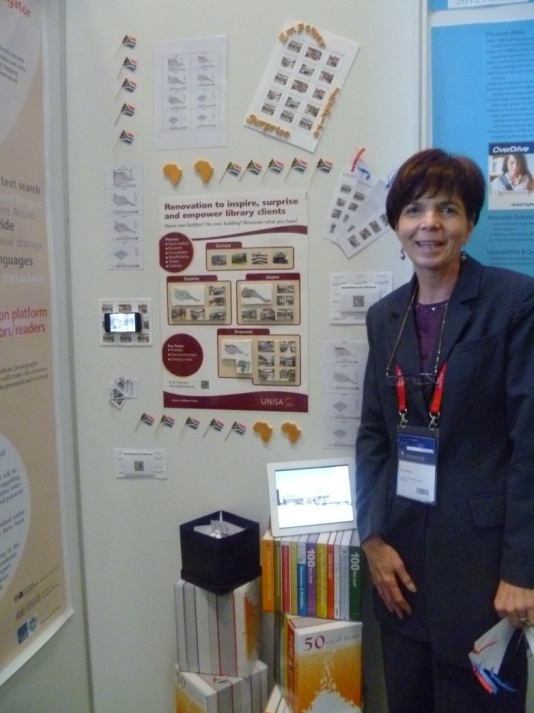 Here’s Judy Henning with her poster on library renovation work at the University of South Africa (UNISA). I didn’t have time to explore all the features but the incorporation of multimedia content on a tablet and iphone as well as the QR code was striking. A high-tech approach isn’t essential though. This Finnish poster (right) made good use of colourful post-it notes as a simple but effective way of conveying an element of interaction. This tied in with the featured project — bringing inventions into the library for users to test and give feedback on. 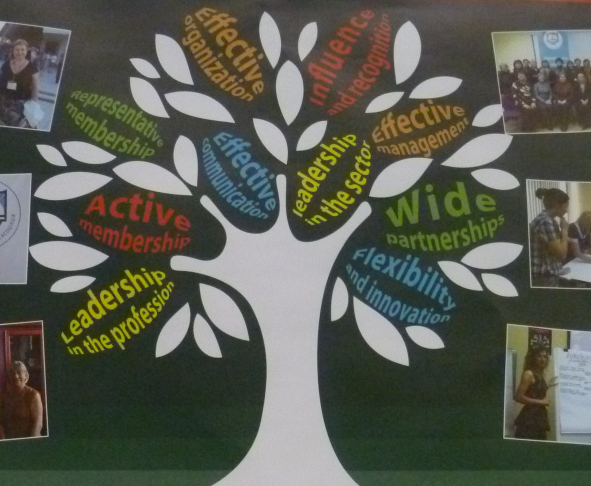 Another poster that caught my eye was the IFLA Building Strong Library Associations programme in Ukraine (below). 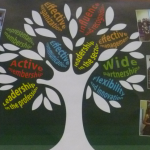 The tree motif incorporating successes of the programme in the leaves was very attractive, combining content with good design and presentation. The surrounding photos brought the activities to life. In short, posters aren’t necessarily posters anymore but multi-media wall presentations complete with refreshments, entertainment and fancy dress. This may not be breaking news, but becomes more apparent when there are so many in a small space. To get the attention they deserve, they need to be designed to “tell the story” to visitors, but also attract them in the first place. 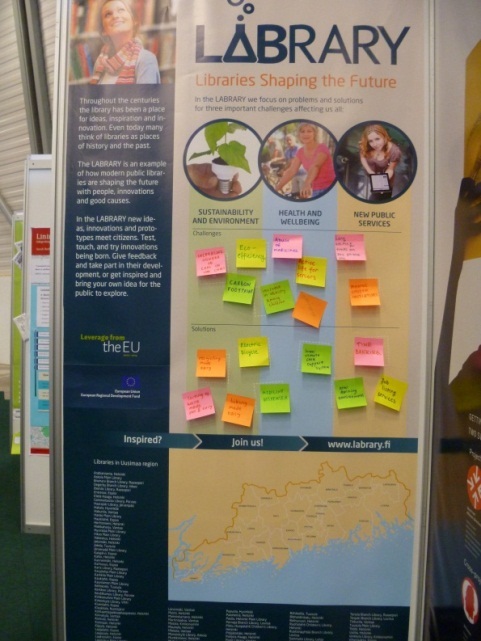 This short IFLA Poster Sessions video gives a flavour of the event, and features some exhibitors describing the benefits of taking part. I thought our 20th anniversary would be a good topic, but came away thinking it would have been more appropriate to present on a particular project or activity … and maybe I need to wear my flashing hat next year. Are library websites gateways or obstacle courses? Emma Farrow is Programme Manager of Library Strengthening and part of the Research, Access and Availability team at INASP. Hi Emma, thanks for the post. Indeed reading it recalled a chat I had with a participant of the INASP Symposium last June in Oxford – on the necessity, now that digital information is gradually “conquering” the sector of scientific/academic knowledge, to re-think the physical space of the libraries.